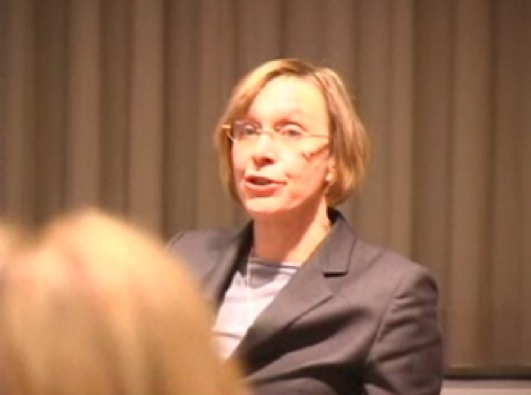 Paula Baker speaking (screen shot) in response to Donald Crichlow's book, Phyllis Schlafly and Grassroots Conservatism at The New School, New York City, March 1, 2006. (http://fora.tv/2006/03/01/Women_and_Grassroots_Conservatism). Of all the professors I worked with in grad school, there wasn’t a tougher one on me than Paula Baker. Or a better one. She wanted and expected more out of me than even my advisors, Larry Glasco and Joe Trotter. If it weren’t for her, I probably would’ve been content with earning all of my degrees at the University of Pittsburgh. But if it wasn’t for her, I wouldn’t have discovered my ambivalence about academia in the first place. I took an upper level history course in US history since 1945 and an independent study with Paula the semester after earning straight-As, the one that made my master’s program a seven-and-a-half month one instead of two years (see “The 4.0 Of It All” from December 2011). It was her second semester as an assistant professor in our department, and given the demographics of the ol’ White boys club, I thought it a good idea to take a professor whose graduate studies were still going on while I was in high school. That, and learning of Paula rare feat (at least for ’84) of publishing an article in the Journal of American History while still a grad student herself at Rutgers University, appealed to the competitor in me. Paula Baker, University of Virginia, Miller Center, December 2006. (http://millercenter.org). I sat down for my first meeting with Paula in her small, windowless office (except for a glass partition that she had covered up so students couldn’t look in), just across from the grad student cubicles on the third floor of Forbes Quad. She said, “What are you doing here?” I didn’t understand her question at first. What I soon realized was that Paula was asking me the kinds of questions I should’ve asked myself two years earlier, when I first started applying to grad schools. She said that there were better options for a doctorate in American and African American history than Pitt, including the University of Michigan and UCLA. There were two things that made Paula, though. One, she regularly broke the law while anyone was in her office, including pre-asthmatic me. Paula smoked as if her life depended on it. For me, it was the first time I thought that I might end up dead before I turned thirty for second-hand smoke and lung cancer. Mind you, my mother, my father and my idiot ex-stepfather all smoked, but not in a space unfit for a sardine. Two, and more important in my second semester of grad school, was her uncompromising perfectionism when it came to my research and writing. Obviously my writing was already good. But it wasn’t scholarly, at least not as scholarly as it needed to be. In writing my paper on the influence of Marxist ideology (perceived and actual) on the early Civil Rights Movement, I must’ve done at least seven drafts for Paula. She probably used up about three ball point pens editing my drafts, crossing out whole paragraphs at a time, demanding that I raise my level of analysis ever higher. And when it was all said and done, Paula assigned me a grade of B+ in my independent study with her, the lowest grade I’d receive in three years of master’s and doctoral work. Still, she turned me on to Adolph Reed, Jr. and Theda Skocpol. What Paula didn’t know was that by the middle of February ’92, I was mentally exhausted, mostly from the previous semester’s work and the lack of a holiday break. I wasn’t at my best in her class and in her office. Somewhere in the midst of struggling to stay on task, I learned how to read for arguments, how to use book reviews to supplement my lack of historiographical knowledge, and to expand my thinking to include other fields, like philosophy and sociology. I also learned that I really didn’t like writing in scholarly-speak. It felt fake, as if I had to learn French and German and high English in order to make an argument that would make old White farts stand at attention. I didn’t blame Paula for this. I fully understood what she was doing and why she was doing it. But I also knew that this wasn’t me, the scholarly world wasn’t quite an exact fit for me. C’est la vie! After April ’92, I took one other independent study with Paula, the following year, to get ready for the comprehensive exams for my doctorate. I took it as a non-graded course, as I knew I was about to transfer to Carnegie Mellon. She eventually left Pitt — not exactly a surprise. I bumped into her once in ’01 right outside Union Station in DC, while she was a fellow at Woodrow Wilson Center and I was in my assistant director job with the New Voices Fellowship Program. Paula didn’t seem happy to see me, but then again, sarcasm and irony always seemed to be the key to getting her smile. Like the irony of me not using my degree in academia.